Of course you'd like to spoil your little treasure when choosing a look for his or her room! It's totally natural, since this is the place where your youngster will sleep, read, listen to music, and invite friends over. 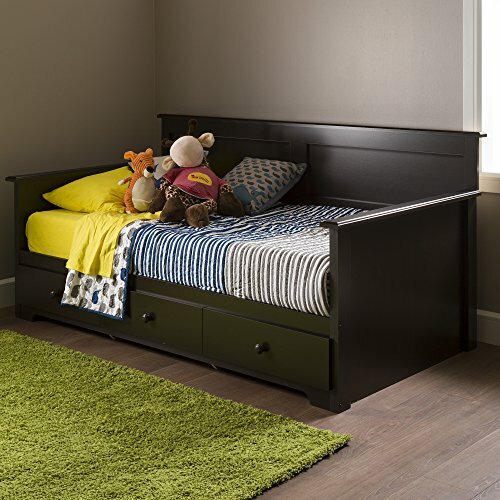 You can use this day bed with storage to create a nice, peaceful environment with a simple yet lively décor. Wooden knobs . Economic since the bed does not require the use of a box spring. Metal slides for smooth gliding. Can support a total weight of up to 250 lb. Drawer dimensions #1: 22.75'' (L) x 17.5'' (D) x 4.25'' (H). Meets or exceeds all North American safety standards. Mattress and accessories not included. Requires complete assembly by 2 adults (tools not included). 80'' (L) x 43'' (D) x 38'' (H). Box #1 dimensions: 86.75'' (L) x 16.75'' (W) x 5.5'' (H), 118 lb. Box #2 dimensions: 50'' (L) x 25'' (D) x 5'' (H), 85 lb. This item ships in 2 boxes, so be sure to have a friend with you – or good biceps! – when it arrives. Packaging tested and certified to reduce the risk of damage during shipment. Made in Canada with non-toxic laminated particleboard. 5-year quality warranty. Any questions? Contact South Shore, available 7/7 by phone, email or chat.